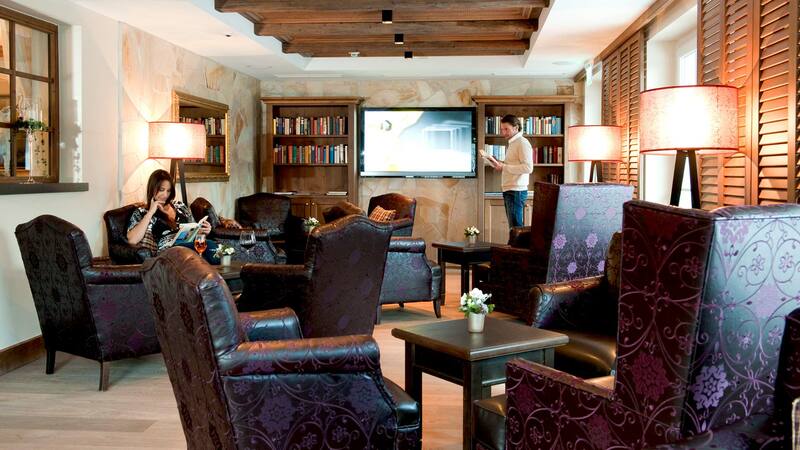 Our bar enjoys the reputation of being one of the best in the entire Gastein Valley. This is due to its beautiful design, chic ambiance and our guests, who feel right at home. This is a place to meet others and simply enjoy life. Feel the exciting atmosphere here. 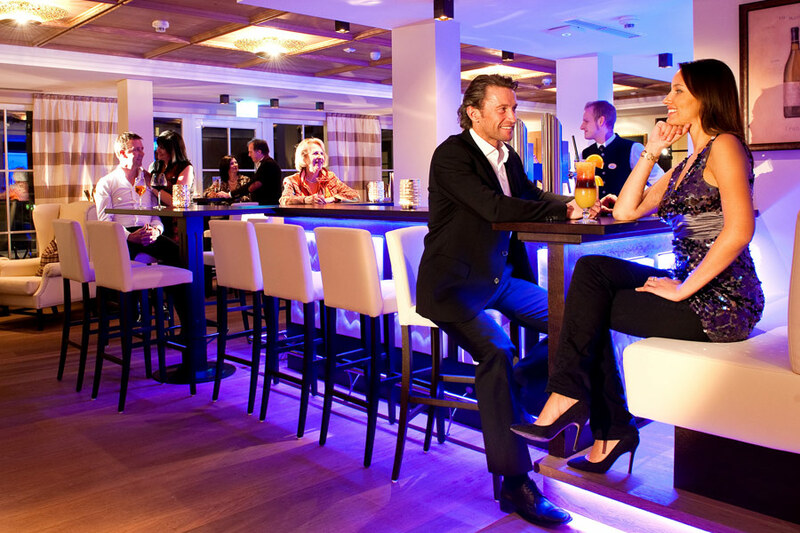 The Hotel Bismarck bar’s alpine style paired with a modern touch and plenty of comfort create a very special venue for relaxing and chatting. Next to the beautifully-lit bar you will find bar tables where guests are welcome to spend an evening of their relaxing spa holiday playing games. Visit us on your winter holiday and we bet we will find you in one of the comfy chairs around the cosy fireplace in our lounge, enjoying a glass of fine wine and a stimulating conversation. Our Chill Lounge with plush white leather chairs quickly becomes many guests’ favourite spot in which to stylishly sprawl at the Hotel Bismarck. With such a selection of places to settle in, you are sure to find your favourite spot in no time! The large terrace outside the Hotel Bismarck bar is a real beauty. The Bismarck terrace with stunning panoramic views is excellent for watching the sunset. 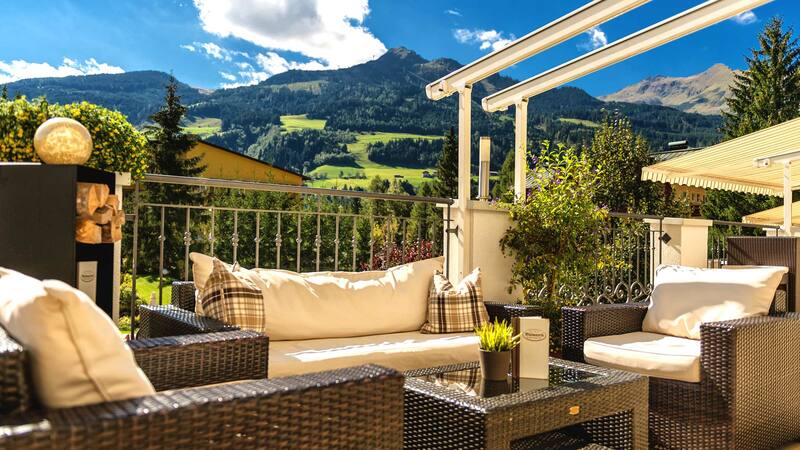 Considered by some to be the most beautiful hotel terrace, this is a popular meeting place for a sundowner or after-dinner drink. If it gets cooler in the evening, we are happy to provide heaters and comfortable blankets. In summer this is a popular place for an afternoon coffee and cake. Depending on the weather, we open our terrace as early as March. … on the piano, keyboard or provided by entertainers. Once a week in summer (in good weather on the terrace) and twice weekly in winter. This is also the venue for fashion shows and exhibitions. For special sporting events (especially football matches), you have the opportunity to watch on the large LCD TV – without sound – whilst enjoying the bar atmosphere at the same time. Or visit the Hotel Bismarck library, just a few steps away, where sporting events are shown with sound.